I am a Division I softball coach. It doesn’t mean I’m a better coach than my colleagues in Division II. It doesn’t mean that my wins and losses are more relevant than theirs, or that I’m higher on my climb up the ladder than them. Division II isn’t the JV version of Division I. It doesn’t work that way. And you haven’t come up short on your goal if you play ball at a school that competes in something other than NCAA Division I. Really. No matter where you play, you join a team that spends all year sweating and grinding together. Laughing together. Picking each other up and pushing each other further. Becoming a family. And when you win a championship and dogpile on home plate with that family…it doesn’t matter what Division you are. Winning is winning, and family is family, no matter what the Division. Even the biggest Division I softball programs may have money available into your junior or senior year. As y’all are well-aware, players are committing at younger and younger ages. So, yes, it feels like you’re way behind when you see kids not yet in high school committed to a college. But those early commitments have created a trickle-down effect that make uncommitted juniors and seniors more desirable: There are plenty of kids who commit early and whose priorities change as they grow up, and the result is they decommit later into their high school career, leaving a hole in that particular college’s recruiting class, and opening up new opportunities for uncommitted athletes. But on top of that, even without decommitments, many schools at all divisions still have money for juniors. We recognize the importance of watching someone grow in maturity, skill and strength before offering them a spot on our team. So if you’re currently a 2020 and you haven’t committed yet…take a deep breath. There are many opportunities still out there. We face plenty of successful pitchers throughout our season that do not throw 60 MPH. Some pitching coaches or programs may want their pitchers to throw over a certain velocity. If that velocity is 60 MPH and you don’t throw that hard…well, then that’s not the program for you. But there are many Division I softball programs who have pitchers throwing under 60 MPH and finding a good deal of success. 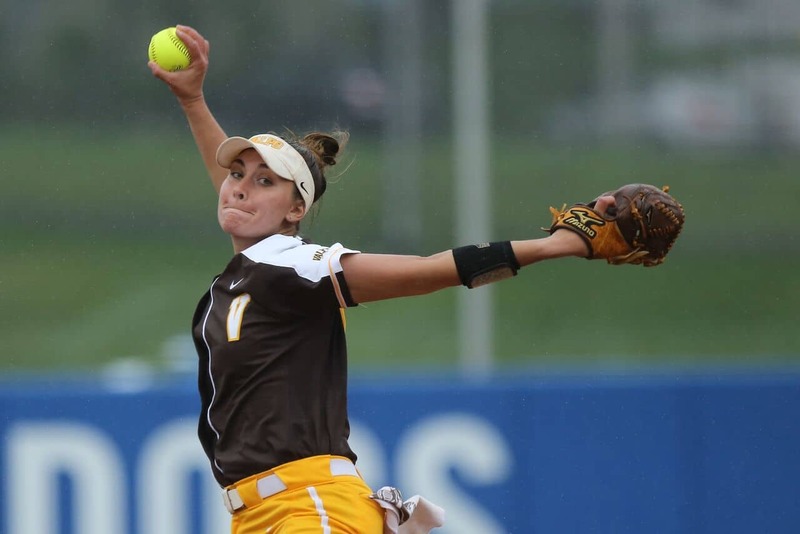 You don’t have to throw 60 MPH to play Division I softball. Have you heard of the University of Alabama? You may have seen them at the World Series. A few years ago they had an incredible third baseman named Kelley Montalvo who I’m not sure topped out at five feet tall. And that was at one of the best softball programs in the country! At the mid-major level, we see a lot of undersized players doing oversized things on the field. Some programs may want their players to be a certain size. If that size is bigger than you…well, then that’s not the program for you. But there are many Division I softball programs who have players considered small. 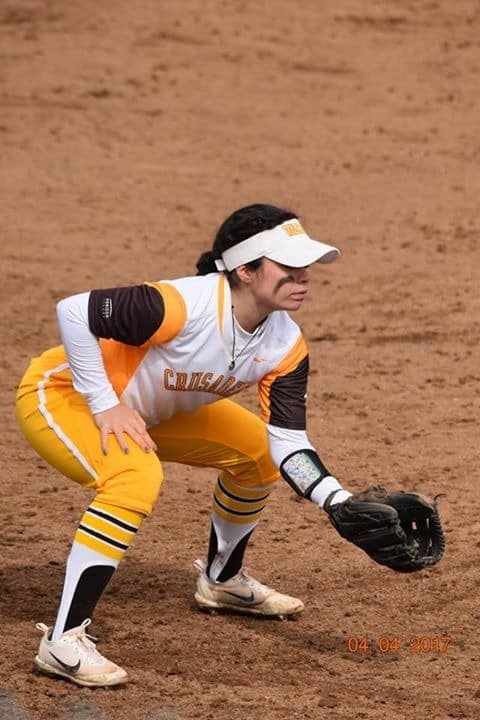 You can be small in stature and play Division I softball. Be honest about your pop time, your home-to-first time, and your pitching velocity. We have stopwatches and we have radar guns, and we pull them out all the time to make sure we have an accurate read on your abilities. Speaking of honesty; we get a lot of emails with inaccurate pop times or home to first times. I’m not a fan of that, but I understand it. If ever you threw a 1.68 even though you typically throw about a 1.8, I understand you putting down your best ever time. And when we come see you play, like I said above, we’ll get our own read on that. However, you cannot exaggerate your GPA. You cannot put your most recent semester’s GPA on your profile sheet and misrepresent it as your cumulative GPA. We need your real, cumulative GPA. This information is imperative for us to assess your ability to get into the school and, once here, to be successful academically. If you have a 2.8, you can’t round up; it doesn’t work that way. We share information about you guys with each other. This happens a lot. If, for instance, a colleague of mine is looking for a 2020 catcher and I’m not, I’ll share info with them on players I know who might fit the bill. If we are at the same tournament, I’ll text that coach if I see a good catcher on the field I’m watching. I’ll send video. I might even ask the team’s recruiting coordinator about them. Yes, we are rivals on the field and we don’t share all the secrets to our trade…but college coaches are also a cooperative group. Recruiting is expansive and not only are we good at helping each other, but when one of you makes a great impression on us but we just don’t have the spot, we’re also good at trying to help you by passing your name along to each other. I’ll take character over skill every day. I was given a really good piece of advice about recruiting “questionable” players that I will share with you. I was told that if I found an incredible athlete with questionable character, I could do one of two things: If I passed on them, they’d go to a rival school and might help beat my team once or twice a year. But if I brought them on with that questionable character, then that person could beat us every day for four years. Our culture is the backbone of our decision-making process, and because of that we care just as much about how you treat your teammates as how hard you can hit a ball. With that said, here are some things we do to evaluate your character. We watch you in the dugout. We watch to see how you head out to your position. We watch to see how you react to your own successes and failures, and those of your teammates. We hear your conversations with teammates while we walk behind you heading to our next field. We see what you post on Twitter and what you retweet. We pay attention to how you interact with your coaches and your parents, because we’ll be spending four years with you. We have a program to grow. We have 18-20 players who are counting on us to bring in people who fit into our family and who contribute positively both on and off the field. And we take that responsibility seriously. So there you have it. A couple myths and a couple truths about the recruiting process. The best advice I can give is to be honest with yourself about your abilities and about what constitutes a fit for you as it pertains to your softball & academic careers and to your overall well-being. And, lastly, I encourage you to focus on the pleasure of playing ball. I can’t imagine the pressure you must feel in the recruiting landscape today, and I hope that you don’t let the college coaches behind the fences eclipse the joy of the competition and camaraderie you have between the lines. Best of luck! 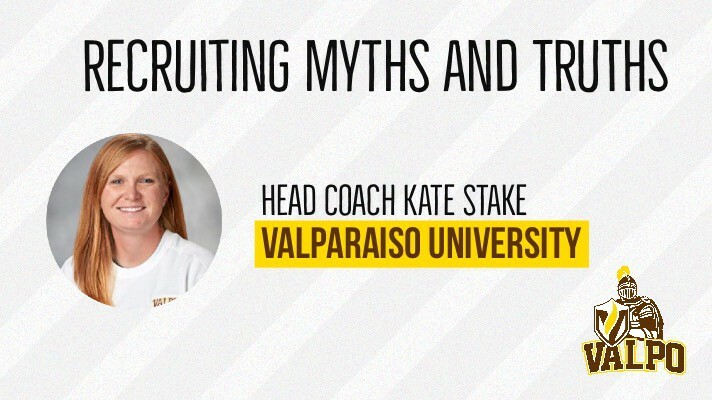 This article written by Valparaiso University’s Head Softball Coach, Kate Stake was previously published in Top Recruit Magazine. 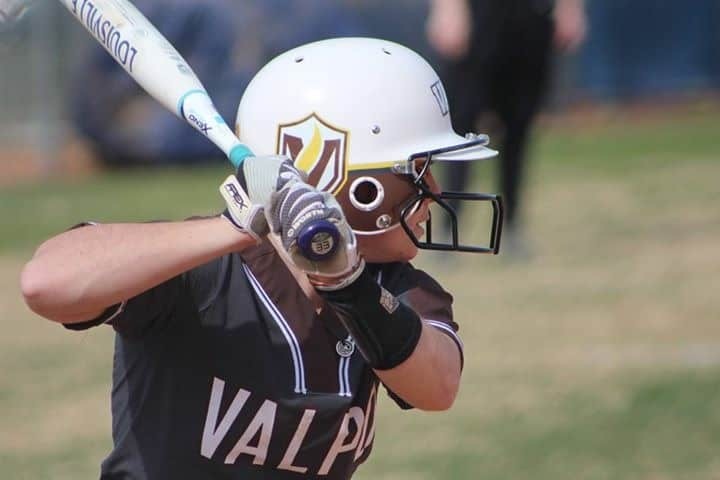 Kate Stake has been Head Softball Coach at Valparaiso University since 2014. She led the team to the Horizon League Championship as well as a to a berth in the NCAA Tournament in her second year at the helm. Prior to arriving at Valpo, Stake spent two seasons on the coaching staff working under NFCA Hall of Fame head coach Bill Edwards, three seasons as assistant coach at the United States Military Academy and three years at Eastern Illinois. Stake earned a bachelor’s degree in English Education from Illinois State and a master’s in kinesiology and sports studies from Eastern Illinois.